As a kid I called it “suki yucky” because I was tickled by the oxymoron (suki means like or love in Japanese). Sukiyaki was a treat growing up. My mom would plop the portable electric stove on the dining table and the meat, vegetables, and tofu would bubble as we filled our bowls, then dipped the piping hot food into a small bowl of raw egg and slurp. She had a well-seasoned iron pot used just for this occasion. I don’t own a sukiyaki pot, which is why I never thought to make it on my own. But reading about Sukiyaki Don in Harumi Kurihara’s Your Japanese Kitchen 1, I was surprised how quickly and easily this comes together. The eating experience is different of course, but the recipe is great for a fast but hearty and satisfying one-bowl meal. 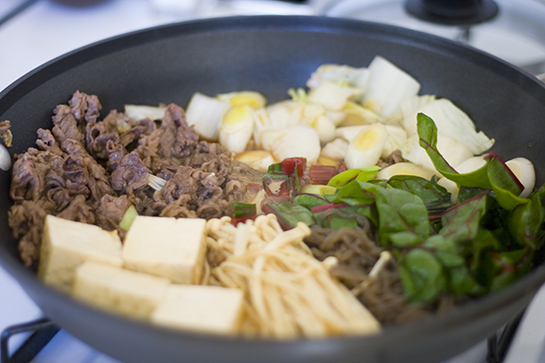 I love the bitterness of shungiku (garland chrysanthemum) in hot pots and dishes like this sukiyaki. The market didn’t carry it, so I had to make due with napa cabbage and chard. If you find it, use it and you’ll see how great it tastes alongside a piece of sweet meat. I know people have a strong dislike for beni shoga, but if you use it in moderation, I think it punctuates the dish nicely, making the flavors more layered. Also, I cooked this in two batches because it didn’t all fit in my 12″ skillet. Bring a small pot of water to boil. Meanwhile, cut leeks into 1/2 inch pieces diagonally. Drain the tofu and cut into 8 pieces. Cut the shungiku (or napa cabbage and chard) into bite-sized pieces. When the water comes to a boil, blanch the konnyaku noodles and drain. When the noodles are cooled, cut into bite-sized pieces. Make the sauce by combining the mirin, sake, shoyu, and sugar in a bowl and whisk. In a large skillet, over medium heat, add a small amount of oil and fry the leeks (and the thick parts of the napa cabbage, if using), and beef until browned. Add the noodles, tofu, and enoki (and leafy parts of the napa cabbage and chard, if using). Immediately pour the sauce mixture over the entire pan and let simmer for a couple of minutes. Turn pieces of tofu and other ingredients, lower the heat, cover and continue to simmer until the vegetables are cooked, about 5 minutes. In the sukiyaki pot, add the shungiku and cook until heated through. In a separate pot, poach the eggs. 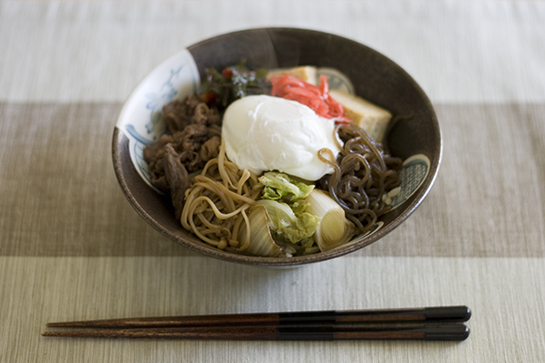 Put rice in a serving bowl and top with sukiyaki, poached egg, and garnish with shoga. This entry was posted in Favorites, Meat, Rice Dishes, Traditional Recipes and tagged beef, donburi, enoki, konnyaku, leeks, napa cabbage, rice bowl, shungiku, tofu. Bookmark the permalink. Post a comment or leave a trackback: Trackback URL. A refreshing and nutritious dish. Made it tonight…yummy! It came out tastier than the chicken sukiyaki I made before, which was a little too bland. The Internet recipe I used called for 2 cups of kombu dashi, but since I didn’t have kombu, I used the katsuo dashi packet, but maybe should’ve used 2 packets? Anyway, the broth ended up diluting the sukiyaki sauce too much (I think) so I liked your recipe better, plus it was more streamlined. The poached egg is a good idea, too, since I like egg, but am a little squeamish about dipping in raw egg. We enjoyed it…thanks for sharing! sufu, I’m so happy you liked the recipe! I grew up dipping it in egg, so I’m not so weary about it, but I can understand how people would prefer a cooked egg. I made this more recently and forgot how easy it is to make. Perfect for a hearty and warming mid-week dinner. Makes great leftovers, too! 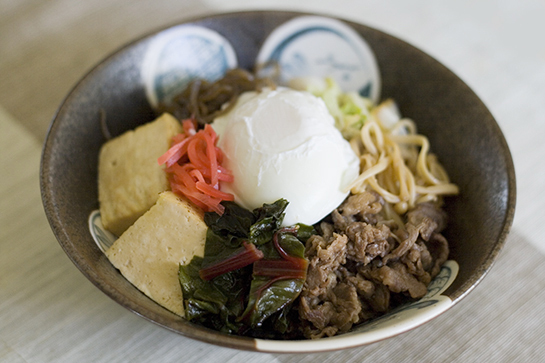 Out of curiosity, do you know if you can purchase a sukiyaki pot? What is it called in Japanese? I’d be interested in picking one up from the Japanese grocery store if I ever get the chance. Thanks for the recipe and the help! Shari, the pot used in Japan is called tetsunabe (鉄鍋, iron pot) and it’s usually a cast iron pot with handle. I’m glad I’m not alone with the raw egg—it’s so yummy! I made this dish for my family last night, it was amazing! We really enjoyed it. Thank you for your blog and all of your wonderful recipes.